I’ve uploaded my Maryland Sheep and Wool pictures! I hope they give you a nice slice of the festival through my eyes. You can see them by clicking the Maryland 2007 photo on the lower left column or on my flickr account by clicking on the flickr icons in the left column. 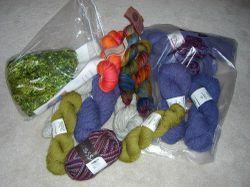 What you see at left is my personal haul, yarnwise. There’s a mixed group there. Some Tess ribbon (apple green), sock yarns (3 kinds), solar processed cormo rainbow, angora/mohair gray neutral for a scarf for moi and a sweater’s worth of cotton/wool from Shelridge Farm. Not bad. I’ve gotta get busy. The best smelling purchase you ask? My Got Soap of course! I love that stuff.